The EPIX PIXCI SV5B Analog Video Frame Grabber captures high quality, uncompressed, scientific quality digital images from standard analog output video sources. 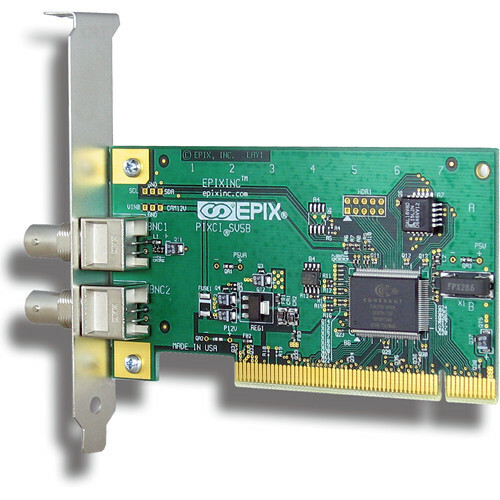 The PIXCI SV5B frame grabber digitizes analog video from NTSC, RS-170, PAL, or CCIR format sources such as cameras, camcorders, VCRs, and ultrasound imaging systems. Color (NTSC, PAL) and monochrome (RS-170, CCIR) video formats are supported. The PIXCI SV5B offers 1 BNC input and 1 Loop Thru BNC output. The S-Video and trigger connectors are removed to allow for a low-profile PCI form factor with a low-profile bracket (sold separately). Capture images with 754 x 480 resolution from any NTSC, NTSC/S-Video, or RS-170 video source. Capture images with 922 x 580 resolution from any PAL, PAL/S-Video, or CCIR video source. Analog image data is digitized and transferred to the motherboard memory with less than 1 horizontal line time delay. As a PCI bus DMA master, the PIXCI SV5B Frame Grabber burst transfers image data without using the host computer’s processor. Live video display is provided with software that transfers the image from the motherboard memory to a graphics card or subsystem. Live, 30 fps (frame per second) display, is available when capturing from any NTSC, NTSC/S-Video, or RS-170 video source. Live, 25 fps display, is available when capturing from any PAL, PAL/S-Video, or CCIR video source. Programmable gain, hue, brightness, saturation, and contrast adjustments allow optimized control of the input video signal. A digital genlock circuit ensures precise synchronization of every image. The PIXCI SV5B can genlock to the video output of a VCR. Four TTL inputs and outputs are available for triggering image capture and controlling external devices. A TTL input signal from a part-in-place sensor can trigger image capture or trigger an image sequence capture. One of the TTL output signals can remove a part from an assembly line, or control extended integration of a camera. The imaging potential of the PIXCI SV5B is limited only by the host computer and peripherals. A high quality computer, graphics subsystem or card, camera, lighting, and lens are recommended for best results. If fast capture rate is more important than vertical resolution, then selecting the Field at Field mode doubles a field capture rate while cutting vertical resolution in half. Capture 50 fields per second from a PAL or CCIR camera; capture 60 fields per second from an NTSC or RS-170 camera. If memory or storage capacity is limited, and field resolution is sufficient, then selecting, Field at Frame allows the capturing of a sequence of fields instead of a sequence of frames (at the camera's 25 fps (frames per second) PAL/CCIR or 30 fps NTSC/RS-170). The PIXCI SV5B Video Format menu allows resolution selection in single pixel increments for greater control, but Field at Frame offers a simple one-click option for added convenience. This is the default capture option offering maximum vertical resolution images at the camera's frame rate. The PIXCI SV5B offers 1 BNC input and 1 Loop Thru BNC output. The S-Video and trigger connectors are removed to allow for a low-profile PCI form factor with a low-profile bracket (sold separately). As many as eight PIXCI SV5 boards can be installed in one computer allowing selected capture from multiple video sources controlled by a single program. Because the multiplexer on each board allows connection of up to 3 sources, a total of 24 sources can be connected. Simultaneous capture from up to 8 sources is possible - subject to the bandwidth constraints of the PCI bus or buses on the selected motherboard. There are motherboards with multiple PCI buses. Each PCI bus has a bandwidth of approximately 110 Mb/s. The XCAP-Lite imaging program, provided with the purchase of the PIXCI SV5B imaging board, allows sequence capture into as much as 64 Mb of computer memory. Individual images can be saved one at a time. The XCAP-Ltd imaging program (sold separately) allows maximum resolution and frame rate sequence capture into the computer's available memory, to a maximum of approximately 3 to 3.5GB. At full resolution and frame rate, capture a color sequence with duration of 150 seconds, or a monochrome sequence with duration of 300 seconds. The XCAP-Std imaging program (sold separately) allows maximum resolution and frame rate sequence capture direct to a 7200 rpm drive or to a RAID system. Using a 750GB drive, XCAP-Std can capture a full resolution uncompressed sequence for up to 5 hours from a color source or for up to 10 hours from a monochrome source. Longer sequence capture is available with more drives. The PIXCI SV5B frame grabber is bundled with an imaging program that allows camera operation and frame grabber control without need to write software. Capture and save images after unpacking the board and loading the software. The XCAP-Lite imaging program, provided with the PIXCI SV5B purchase, provides video format / mode selection, triggering, live display, and image / sequence capture to computer memory. Individual images can be saved in several industry-standard formats including TIF, BMP, and JPEG. The XCAP (sold separately) is a menu-driven, interactive program for the PIXCI imaging board, allowing capture, display, viewing, processing, printing, analysis, measurements, loading, and saving of imagery. It includes a script language for customization and automating tasks. XCAP is available for Windows. The XCAP-Ltd program adds the ability to capture sequences (uncompressed full-motion video movie clips at 25 or 30 fps) to memory up to a maximum size of approximately 3.5 gigabytes (computer configuration dependent), and includes the ability to save sequences. XCAP-Ltd also provides annotation - the ability to write text on an image. For image processing and video to disk, purchase XCAP-Std (sold separately). In addition to all of the capabilities just described, the XCAP-Std program offers extensive processing, measurement and analysis capabilities including filters, mathematical operations, blob analysis, and particle tracking. The availability of scripts and the blackboard allow customization and automation of included operations. Sequence Capture options include the ability to capture video sequences to a hard drive. The PIXCI SV5B Frame Grabber, with XCAP-Std, can capture full-resolution video for 10 hours with a 750 gigabyte hard drive. EPIX developer libraries ease custom software development with hundreds of functions for image capture, processing, measurement, and analysis. Libraries are available for Linux, Windows, and 32-bit DOS. The XCLIB (sold separately) "C" libraries for allows accessing the PIXCI imaging board. It supports DOS, Windows, and most popular "C" compilers. The library provides command and control functions for capturing image data from a video source and implements transfer to computer memory, graphics cards, or hard drives. XCLIB-Lite (sold separately) is an economical and reduced capability version of XCLIB. The PXIPL library (sold separately, includes XCLIB) simplifies the development of software for processing, measuring, or analyzing images after they have been transferred into the computer. XCLIB and PXIPL provide high-level services that allow the software developer to concentrate on the imaging application rather than focusing on board level controls. The multiplexer selects the video source for the Programmable Gain from either the S-Video input connector or from the composite video source on the BNC connector. The multiplexer may be switched during vertical blanking. Compensates for reduced amplitude in the analog signal input. Gain can be programmed from 0% to more than 200%. Provides analog to digital conversion of NTSC, RS-170, CCIR, PAL, and the luminance (Y) component of S-Video sources. Provides analog to digital conversion of the color (C) component of S-Video. Separates the Y/C components, generates the U/V color difference signals. Automatic synchronization circuitry for precise digitization accommodates video sources which have variable periods, such as video tape recorders, generates the pixel clock for transferring image data to the PCI bus interface. Interpolation is used to scale images to 1/14 of their original size. Image sequences may be captured at full or reduced frame rates. Four input and output TTL triggers can be used for synchronization with external events. The trigger signals are controlled by the host CPU. The PIXCI SV5B Frame Grabber will operate in 32- or 64-bit computers configured with up to 4GB of memory. Transfer Rate Requires a PCI motherboard with burst mode to host memory data rates of at least 30 Mb/s. Contact EPIX or an EPIX distributor for suggested motherboards. Display Windows: Display resolution as per installed VGA device driver. A DCI compatible S/VGA Adapter is required for real-time display. Color display via adapters supporting 24-bit RGB. S/VGA, adapters must be VESA 1.0 compatible. Box Dimensions (LxWxH) 7.4 x 6.1 x 1.1"